Do It Myself Blog – Glenda Watson Hyatt » Viva Las Vegas! Wow, what an amazing trip! 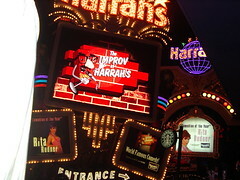 Las Vegas is indescribable. Everything is humongus, bright, with bells ringing and lights flashing all of the time, and people everywhere. Yet, I felt relatively safe. But, man, the food is salty (and expensive â€“ or, at least, every place we ate was)! I need to detox on Dr. Oz’s green drink for a week! Even though the flight from Vancouver to Las Vegas was not quite three hours, we were twelve hours getting from home to our hotel. Traveling to a new place, when I don’t know exactly where to go or what to expect around the next corner is somewhat disconcerting and very exhausting. I confess our first night in the city that never sleeps was not a late night! We were up early, again, on Wednesday to take the monorail from our hotel, the Imperial Palace, to the Las Vegas Convention Center, which dwarfs our Vancouver Convention & Exhibition Centre! I really liked the monorail; I felt much safer than I do on our Skytrain transit system. The Left Thumb Blogger at work. Serious stuff! On Wednesday, b5 media put on a bonus day before BlogWorld officially started on Thursday. The sessions were informative and I was glad I had taken my laptop with my brand new full-size roll up keyboard. Many people were blogging while listening to the sessions. I was lucky to keep up with taking notes and manage the occasional tweet. That is why there hasn’t been a new post until today. 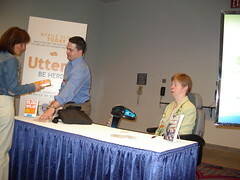 I figured I went to BlogWorld to learn and to meet real people, not to spend hours at my keyboard! 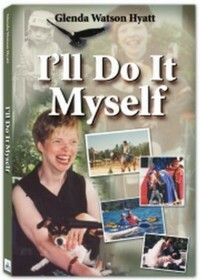 Thursday at noon, I held my first ever book signing. I had the honour of sharing the table with thee Andy Wibbels, author of Go Blog Wild! His book story is amazing and was one of the things that kept me going while writing I’ll Do It Myself: A publisher happened across his blog, liked what she read and offered Andy a book deal on the spot! Go Blog Wild is now in its third printing and was just released in Poland. That is a writer’s wildest fantasy! Being serenaded by the King! I couldn’t go Vegas without one Elvis sighting at the Hilton! Because I was still being weaned off of Sesame Street and Mr. Rogers at the time of his death, I hadn’t experienced the Elvis craze while he was alive, although I have enjoyed his music and movies. 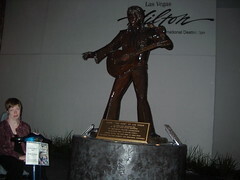 Being at the Hilton where he had performed 800+ shows over eight years, I felt a connection to rock n roll history. Since I missed the Elvis era by a few decades, to me, the ultimate Vegas experience would be to see Barry Manilow in concert. I’m not sure I can explain why; it just is. Perhaps its because I feel his passion for what he does coming through his music: “I am music and I write the songs/I write the songs that make the whole world sing/I write the songs of love and special things….” What an awesome life’s purpose! And to be able to live it â€“ that is why I admire him. Well, since the Hilton was next door to the Convention Centre and since Barry happened to be performing last week (information I happened across before leaving home! 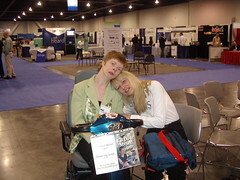 ), we decided to see if wheelchair seating was still available and how much. Considering one of my life’s goals to live without regrets, Darrell purchased two tickets. Sitting there in row 19 in a relatively intimate venue in Vegas (I’m not sure if itâ€™s the same venue Elvis performed in), waiting for Barry Manilow to appear, knowing that this was an once in a lifetime opportunity, I found it difficult not to get a little teary. This year has been amazing for me! I’m so thankful I’m here, able to have all of these experiences. In the photo, the guy in the yellow jacket is Barry Manilow! Honest. (I will soon have the credit card bill to prove it!) He gave a passion-filled performance. I was a little sad when it was over. In addition to seeing Barry Manilow so close up and personal, the other awesome highlight of the trip was meeting some of my imaginary friends in person, some of which had hosted appearances on my first virtual book tour; to hug and hear the people behind the two-dimensional photos and written words. Wendy Piersall came running when she spotted me. Hanging out with fellow SOB Liz Strauss! What else do I need to say? This photo with Chris Brogan is my favourite from the trip. He has a signature pose where he scowls at the other person. Apparently no one has ever scowled back, until this red-head came along! Rather than scowling at one another, we ended up laughing together. Thanks for the laugh, Chris. Meeting Des Welsh all the way from Australia, after communicating since my Ryze days, was another special moment. Attending BlogWorld validated for me that blogging is, indeed, real, is an industry, is a profession, and is where I belong. I did not feel alone in the least like I have at other conferences. I now know for sure that I can make a living doing what I love: writing and connecting with people from around the world. 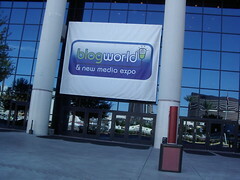 A big thank you to Rick Calvert for his vision for BlogWorld. See you in Vegas next September 18-19th for the second annual BlogWorld! Damn! I always seem to miss out on the fun stuff! Sounds like it was ‘wunderbar’! Glad you are having a blast and that you were able to experience it with Darryl! Glenda, how did the rollup keyboard work out? Got one a week ago and have not had time to test it out. Saw Barry Manilow in the late 70’s at Queen Elizabeth Theatre in Vancouver. 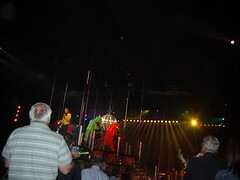 Did you know that the PNE celebrated the 50th anniversary of Elvis coming to Vancouver this year. Red Robinson was the MC that night and again on the anniversary. Keep typing girlfriend; and I’ll keep voting! First time here and all that and I have to say that you’re one truly amazing lady. I’ve always seen you around Liz’s place (what would Open Mic be without you?). Glenda – You light up the room with your smile and energy. So glad we had a chance to connect even if for too brief a moment. Great Pics, glad you had such a wonderful time. I’m new to Blogging and loving it. Still learning as I go along. Your spirit and commitment is very motivating. Keep it up. A highlight of the event, meeting you face to face and having me picture took with you, my dear. 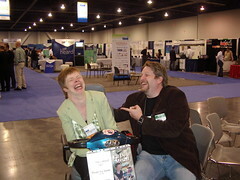 I hope that as you and Darrell have blazed the trail, other differently-abled bloggers will consider being at BlogWorld next year. Blog on!